Democrats howl about Putin’s offenses, but not in Latin America. Americans are rightly upset over President Trump’s obsequiousness toward Vladimir Putin in Helsinki. The former KGB agent heads a gangster government, and Mr. Trump should have stood up to him. On the other hand, Democrats’ moralizing Helsinki hysteria is phony. They’re upset with Mr. Putin’s meddling in the 2016 presidential election because Hillary Clinton lost. When it comes to Russian expansionism in the Western Hemisphere and the Kremlin’s abysmal human-rights record, the American left mostly looks the other way. Democratic ballyhooing over Mr. Putin’s habit of jailing and sometimes killing his political and media opponents is especially rich. Russia’s longstanding ally Cuba has an even worse civil-liberties record. Yet when President Obama unconditionally reshaped U.S. policy to please Cuban dictator Raúl Castro, his party cheered. Mr. Obama even trotted off to a baseball game in Havana with the Cuban mob boss. Democrats cheered some more. Advocates of the Obama Cuba policy argue that Havana poses no threat to U.S. interests. But if regional security, stability and economic growth matter, that is demonstrably false. Sixty years after Castro came to power, Cuba, with strong backing from the Kremlin, still underwrites tyranny in Central and South America. Venezuela is Exhibit A. And now there is blood-soaked Nicaragua, where Cuban Foreign Minister Bruno Rodríguez arrived on Thursday to celebrate the 39th anniversary of the Sandinista rebel victory over dictator Anastasio Somoza. Daniel Ortega, legendary leader of the Marxist Sandinistas—longtime heroes of Democratic politicians such as former Secretary of State John Kerry, Vermont Sen. Bernie Sanders and New York Mayor Bill de Blasio, to name a few—is at war with his own people. Since April, when university students began peacefully protesting Mr. Ortega’s decade-plus consolidation of power, national police and pro-government militias have cut down some 350 Nicaraguans. Many have been murdered by sniper fire. Others have been shot at close range. This state terrorism is copied from Venezuela’s military dictatorship, which has flattened its student-led opposition. In both cases a youth movement believed that its commitment to truth and freedom gave it the undisputed moral high ground. In both cases the dictatorship unleashed paramilitary forces to crush them. In both cases students met with jackboots, nighttime raids on their homes, torture and prison. Both authoritarian regimes are born of the same ideology, and have the same progenitors: Havana and Moscow. Cuba has been instrumental in suffocating dissent in Venezuela by infiltrating the military, academic institutions and media. Now Castro’s regime, together with Caracas, is aiding Mr. Ortega. Students arrested and tortured in Nicaragua have reported hearing Venezuelan and Cuban accents in clandestine jails. Outside help for intelligence-gathering, paramilitary training and weaponry also comes from beyond Latin America. Clearly, some of it comes directly or indirectly from Moscow. Around 2005, Mr. Putin began rekindling Russia’s warm economic and military relations with Cuba. He also has re-engaged with Nicaragua. As I noted in a July 8 column, the Interior Ministry of Russia recently completed a multistory “Police Training” center in Managua. Mr. Ortega says it is for counternarcotics work. That’s laughable given Russia’s closeness with narco-states such as Venezuela. A more likely purpose is repressing dissidents so Mr. Ortega can retain power. In a June 2016 essay for a Central Intelligence Agency peer-reviewed quarterly, Robert Vickers examined Nicaragua’s Cold War history and its current relationship with Russia. Mr. Vickers reminded readers of an airfield 60 kilometers north of Managua called Punta Huete. “It was constructed in the early 1980s—soon after the leftist Sandinista regime took power—with Soviet funds and Cuban technical assistance,” Mr. Vickers wrote. Its exceedingly long runway was designed to accommodate heavy bombers. The airfield wasn’t finished during the Cold War, and the project sat idle after the Soviet collapse and during the eclipse of Mr. Ortega in the 1990s. But when he returned to power in 2007, the Moscow-Managua axis was restored. 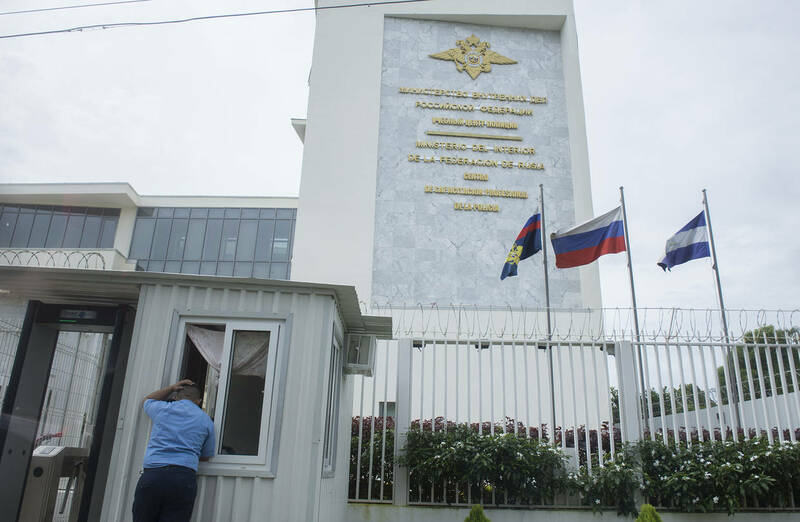 Punta Huete was completed in 2010 with, according to Mr. Vickers, “Russian financial assistance.” Russia recently donated two Antonov military transport planes to Nicaragua. It sold Mr. Ortega 50 T-72 tanks in 2016. To what end? One wonders. Mr. Trump should call Mr. Putin on all this. Meanwhile, if Democrats want their outrage over Russian meddling to be credible, a little concern about the mounting body count in Nicaragua is a good place to start.